Skin ailments are a symptom of an inner disharmony in the body. Skin is the largest excretory organ of the body and toxins can escape through the skin. If there is something wrong in the body or toxins in the liver and digestive tract, an autoimmune disease or hormonal imbalances, it can manifest as a rash, usually itchy and uncomfortable. Most people suffer from a skin condition in their lives. From a newborn baby onwards, skin problems can be dealt with and diagnosed. The cause of the problem will be determined and the cause will be treated so getting to the root of the problem. Skin problems can affect the sufferer’s self esteem and confidence if skin is not aesthetically pleasing. 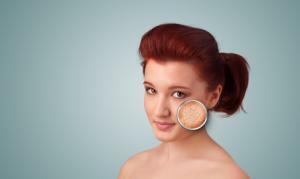 See article about skin on Articles Page. Treating skin has to be viewed holistically to repair the whole body so in addition to healthier skin overall health can be achieved. Leanna Broom has been treating Skin Problems with great success for twenty over thirty years. She uses Herbal remedies internally and topical applications to soothe while the inner remedy gets to the cause.